The Eugene Area Chamber of Commerce's OPEN for Business was re-imagined in 2018. With a new robust content strategy, a new look, and a move to a quarterly publication - the new Open for Business will highlight all it means to do business in Eugene. We're diving into the topics impacting businesses, the leaders changing the game, and the programs impacting our economy. Request a subscription to Open for Business today. Q1 - The Rise of the Creative. Please note: Only high-resolution photos will be printed. Please submit photos at 300 dpi, CMYK. The Eugene Area Chamber of Commerce E-News is sent weekly. It includes mission-related updates, as well as announcements about upcoming events and opportunities for members. 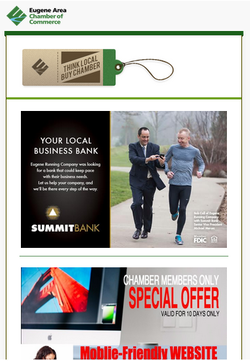 To subscribe please contact Matt Wunderlin at mattw@eugenechamber.com. Buy Chamber is the Eugene Area Chamber of Commerce’s member-to-member marketplace sent the first Friday of each month to eNews mailing list. Advertising is available. ​Stay connected with what's happening at the Chamber and across Eugene, including upcoming events.